It's been two years since an episode from The Legend Of Dark Witch series graced a Nintendo platform (episodes one and two were digital titles that shot their way onto the 3DS eShop), but The Legend Of Dark Witch 3 - Wisdom And Lunacy is almost ready to cast its own spell, compete with fresh moves, brand new effects and more. A 2D, side-scrolling shooter in the vein of classic Mega Man, TLODW3 places you in the magical shoes of series regular Zizou, who returns to Earth to check everything is running smoothly, only to discover another witch is running amok. Cue platforming, bullet hell gunfights and plenty of big bosses to take down. TLODW3 is also the first instalment to feature 3D effects, so expect this one to look even more impressive. Updates include the power to use magical items as much as you want (rather than being limited to a set number, as with previous entries) and a series of hidden Syega crystals to hunt down for added upgrades. There's also a new move to add to your arsenal (the 'Lord Attack', perfect for closing the distance on enemies with a painful dash), and you'll be able to make good use of it since the game features the most levels in the game's history, as well as four difficulty settings for added replay value. 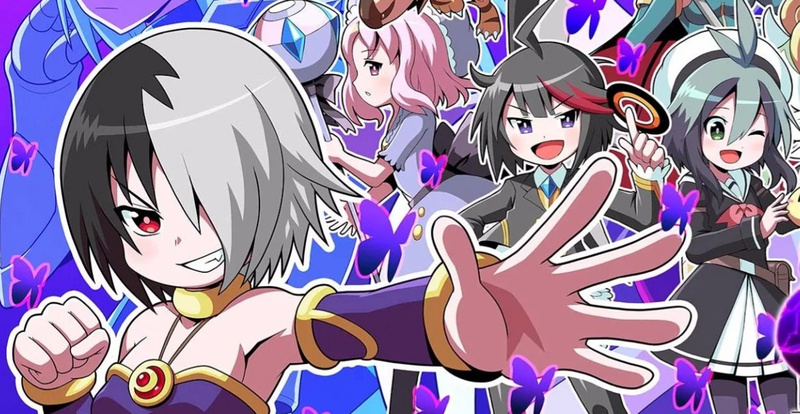 Has the The Legend Of Dark Witch 3 bewitched you with its 2D shooter visuals? It'll be arriving on 21st December with a price tag of £9.99/$9.99. Still need to get the second one. Still have to get the first two. Maybe next year. There are more 3DS owners than Switch owners, hence why this came to the 3DS. Also the first two are on the 3DS. I have a Switch too but do more gaming on my 3DS and that’s not going to change anytime soon. @Kalmaro I'm unfortunately with you on this Which is a shame, because I love the series, but my 3DS is now packed, and I don't plan to take it out again. Though, since the side games have started coming on Switch, I'm guessing it's only a matter of time (even more since I predict there won't be a lot of sales for this one at this point in time. Eshop money is now made on Switch). YES!! I still game on my 3DS from time to time, despite having moved onto my Switch, so I have no problems with this releasing on 3DS first. Edit: No idea why the 3DS is being looked down upon for this game. We should be happy this game is releasing on a platform, even if it's not on the newest system. You'd have to be made of stone to not like these games. I'll gladly buy this one on 3DS but the Switch Trilogy is what I'm really waiting for. What a silly attitude. It’s a simple game graphically and doesn’t really get any particularly benefit from Switch. If you loved 3DS why does Switch have to immediately render it completely irrelevant? Why does a game have to be on Switch suddenly to be playable. The game has been in development since well before Switch dev kits were avaible to the developer anyways. People with these views should stop posting about it. No one cares If you don’t care about a game and don’t have anything constructive to say outside of Switch port begging. People really need to realize people don’t want pointless negativity and we don’t want every 3DS article, topic, page etc. turned into Switch port begging and “3ds is dead” nonsense. Anyways looks like they went all out on this. Lots of content for a Megaman esque 9.99$ 2D platformer. @Pikachupwnage I understand your feelings. Since you are so passionate about this I'll expand on what I was saying. My main reason for getting the 3DS was portability. The games I assumed would be good because it's Nintendo. Sure enough, the 3DS became one of my favorite consoles. I could take it with me and play some very nice games. However, now the Switch is here and it fills that same niche while also allowing me to play games I normally would have to be at home to play. So not only do I get portability and the exclusives that I love Nintendo for, but also the games I couldn't play originally when they came out (Skyrim) and on the go! Something the 3DS could not have brought me. Not only that but they are on a bigger screen, which is great for my big man hands and if I want to play with someone, most games I can just pull out a joycon and go to town. Because of all this, I just don't touch my 3DS anymore. It's given me many years of enjoyment but now it is time to move on. I'll get this. The previous two games were good fun. What would really make me happy is a Brave Dungeon 2! @Kalmaro Wow, that is exactly where I’m at. I still have plenty left to play and yet I never touch my 3DS anymore because the Switch basically provides me the same thing but better. @TimeGuy Glad, I'm not the only one. For $10 how can you go wrong. Pretty much, so I'll just get the PC version again like I did with 2 (which also came with 1 and both OST for $10, pretty good!). @CapricornDavid That or a more traditional Dark Witch JRPG. I'll take either one. @Kalmaro Same here, would prefer to see these make the "Switch". Perhaps we could see a trilogy release on the Switch in the future? The spin-offs have been alright on it. Anyway, this one has 3D huh? Awesome. I was wondering why the first two didn't have it, but it's kinda strange to implement 3D now when most have just stopped bothering with it. You'd think the first two would have 3D, and this one wouldn't. Oh well. I'll enjoy it. @OdnetninAges Exactly! The Switch is great and all, but I still spend much more time with my 3DS. Pokémon Shuffle is a big reason, sure, but the 3DS is WAY more portable, and its and the DS's library of games is just incredible. The DS is easily one of my favorite systems to collect for, it has so many amazing games. I can't see myself not playing the 3DS regularly in the next few years at least. But then again, I'll bust out any retro system from time to time. Sorry for keeping you waiting for such a long time. and thank you for your message. Please wait for a few days. No Switch, but, Yes Buy! @SakuraHaruka Hope you enjoy it. @Oat I actually haven't seen many articles with people begging for anything. Usually folks just say they won't get it if it's not on Switch or asking if it will come to Switch. I don't think begging in the proper term. @Kalmaro That's still silly. There have been tons of great games over the years on 3DS (including the entire DS library) that will never see the light of day on Switch. There's absolutely no reason people can't keep and continue to play games on their old systems alongside the latest releases on their newer system unless that newer system is already backwards compatible with the old system's games. @BulbasaurusRex There have been many games over the years on the 3DS that have been very good. I have played them too... And now I'm done with them and I've gone to a new system that is getter newer and better looking games that still hold the same quality. No one is telling anyone to stop playing on the 3DS. We are just asking that the new games coming out come to the Switch since it is here and the 3DS is being phased out anyway. I am glad to see LOTDW get yet another game on the 3DS. On the controversy, if you do not want to play on the 3DS, then that is your choice. Those of us who still have and actively play 3DS hardware (especially the barely 3-year-old New 3DS hardware) still enjoy seeing new games pop up now and again. After 6 years and well over 69 million units confirmed sold combined across all family lines, it is still a viable software platform. Sure, it's days are numbered, but please stop trying to shovel dirt on top of it — it will remain one of the most significant (and wanted) legacy platforms for years to come. @Kalmaro So you admit that you're just throwing away your other games that are just as good just because they're not the latest thing. That's just silly when you could just as easily keep them around and also continue to play them alongside your new games. Anyway, despite that, while receiving a lesser focus now, the 3DS is still far from discontinued when it's still receiving several new releases including recent gems such as "Metroid: Samus Returns" and "Pokémon Ultra Sun and Ultra Moon." Some games simply work better on a dedicated portable system that while technically inferior does have some different features such as dual screens, stereoscopic 3D, a built-in microphone, StreetPass, and constant access to a touchscreen. Even by your way of thinking, you're a fool for giving up on a system while it's still receiving decent support. @BulbasaurusRex Throwing away? I'm not sure I understand. I specifically said that I'm played the games I found good and now I'm moving on. No where did I say I was throwing games away. It seems like you are just looking for any way to attack me without reading what I've said. I guess I'm going to end things here, all you're doing is attacking and insulting me and acting like your opinions mean more than they do. Better looking games doesn't always mean better gameplay, the Switch has many garbage games that look better than 3ds games. Also since when did Nintendo fans give a toss about better looking games, Nintendo have been releasing hardware for ages now with less than adequate graphics, that excuse don't cut it. Many ppl have jumped from 3ds to switch and think it's something very special, it's just yet another piece of hardware to play games on but still lacking in many departments compared to other hardware. Yes i have a switch but it's no big deal, tbh i was hybrid gaming long before the switch released, it's not a new concept and Ninty certainly wasn't the first to bring hybrid gaming to the consumer. @Kalmaro You are throwing them away if you never play them anymore. What's the difference between packing them away with no intent to ever play them again and actually tossing them in the garbage? @WhistleFish Since when where Nintendo gamers unable to appreciate good graphics? Being a Nintendo fan means just that, being a fan of Nintendo. I still am a huge fan of their games and the fact that they now look even better while still holding quality is fantastic. I'm not sure where the controversy is. Also, I'd have to argue that the Switch has brought hybrid gaming to a level we have yet to really appreciate until now. I'm talking current generation games on the go that can be switched between console and portable on the fly. Not only that but the Switch has shown Nintendo taking more risk and 'leading the oack' so to speak. They are allowing their IPs to be used into different ways, like Mario + Rabbids and Link getting a Zelda game on a much grander scale than before. @BulbasaurusRex The difference is that they are not in the garbage, they are right here with me and should I be in the mood I'll pick them up again. I'm just not in the mood and thanks to the Switch doing what the 3DS does but better, I probably won't be. Blame Nintendo for making such a good product. Since the cube days all Ninty machines have had lesser graphics than their competitors, you mentioned in a earlier comment that you have moved on from 3ds to switch which has better looking games. I say worse looking compared to its competitors but that shouldn't matter to ninty fans because it's been like that for years. @WhistleFish I said I've moved to the Switch because they have better-looking games while also still holding their quality. I believe I also mentioned that they still have the exclusives I enjoy. So I essentially just said I moved to the Switch because that's where the better looking and new Nintendo games are at. Not to mention the 3DS is being phased out and the Switch fills the same niche that I got the 3DS for. I'm very certain that 2018 will not be the last year for the 3DS.at the same time, there are not many 3DS games coming out that are getting the same amount of attention from Nintendo that the Switch is getting. When the next Pokémon game comes out the 3DS will pretty much be done. Also, when I said better I was comparing the graphics to Nintendo. No point comparing to the ps4 which was basically designed for hyper-realism. Nintendo has its own style. @Kalmaro Then just keep your 3DS unpacked for when the rare new 3DS exclusive game you want like this one does come out. It's not like it takes up much room. Anyway, like I said, they are two differently designed products. The Switch is not just a better and more versatile 3DS. The Switch can't fit into your pocket or be placed in sleep mode. The Switch doesn't have dual screens or a built-in microphone. The Switch doesn't have StreetPass. The Switch's touchscreen can only be used in portable mode, so it can't be used for games that require the touchscreen to play. A series like "Legend of Dark Witch" that has a simplistic graphical style, no multiplayer modes, gameplay better suited for portable play, and makes decent use of the second screen is better off as a set of 3DS exclusives rather than being shoehorned in as a Switch port, especially since one of the selling points of this new game is that it's finally using stereoscopic 3D for the first time. Fair comment mate, yes Ninty certainly have their own style. I don't buy many games developed by Ninty, just zelda and prime. Oh and Xenoblade Chronicles 2. I'm actually a bit frustrated. I'm so used to Nintendo having long periods of time between games, now Nintendo has stuff every month and my wallet is crying. @BulbasaurusRex Why do you assume I even packed up my 3DS? It's actually on the floor right next to me. I'd rather the new games come on switch as well as 3DS though since I don't feel like carrying two portable systems. 3D doesn't impress me much with the 3DS, I wish the bigger and better 2DS came out sooner, the 3D Linda hurts my head. Yoshi, from the looks of it, I could agree being garbage at the moment. Kirby? Lol, no. Not even close to being garbage. MC looks like Black Jack. @INSIDE_SYSTEM I just made an account to comment. I love these games! I love the Mega Man × Gradius mechanics of the main three games and I love how addictive (and the art style) Brave Dungeon is. I would love for all three Dark Witch games to be on the Switch! I will double dip because I love them and the spinoffs. @TrevorMcD Thank you from the bottom of my heart. I want to do my best in the future too.